I’m a trained graphic designer who started a blog in 2009. Wit & Delight was personal project to get to know myself through sharing my love for design, food, fashion, and travel. In 2013, I began publishing personal essays exploring my journey through divorce, mental illness, and an undiagnosed learning disability. 3.3 million followers later, Wit & Delight has become a resource for others to feel less alone in the ups and downs of their journey through life and where readers can find suggestions on where to travel, eat, or shop from someone they’ve come to know as a friend. How did you start experimenting with prints and stationery design? Making things has always been where I’m most happy. 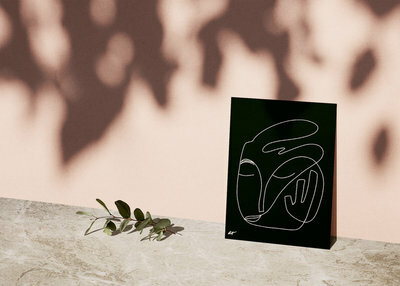 I guess you could say that making prints and stationery is really about going back to my roots and connecting this community I’ve built with tangible products available in real life. I start with word associations when making artwork... it is how I develop the conceptual framework to guide design choices. From there I sketch thumbnails and select one or two to begin exploring either on my computer, iPad Pro, or with physical materials like paint, paper, canvas. I work within a select palette of colors and materials so I don't have as many big decisions to make while I'm working on composition. What inspires your use of materials in your products? Materials often drive my creative decisions because my design sensibilities tend to skew towards a minimal and functional approach. I love where beauty and function intersect and really believe there is too much bad design in the world when it comes to the objects we use everyday. And design for design's sake is wonderful but I get more excitement about making something beautiful and useful. Focusing on good materials is part of letting the functional aspects of a design drive aesthetic/style-based decisions. Amazing things happen when you remove the pressure to make something amazing every time you sit down the create. Most of my creative breakthroughs happened when I have the mental space to see opportunities in quick sketches. Then you can take the time and effort to take those ideas and flush them out. How do you stay motivated for personal / self-care goals? I'm doing a really bad job at this right now. I'm currently reading "The One Thing" in an attempt to simplify my goals both at home and at work. My morning routine is really dictated by my kids right now, so typically, I wake up at 7 am. . We have a 7-month-old and 24-month-old, so if either one of them is up during the night, I sleep until they wake up. 7-8 am: We eat breakfast together, listen to the news, and get ready for our nanny to arrive. My bag is usually packed the night before, so I throw on some powder, lipstick, and mascara and head out the door. 8-8:30 am: Podcast and me time on the way to work. I purposely make my commute a little longer so I can finish one podcast on the way to work. I drive through Starbucks and listen to a business-related episode from any one of my go-tos: HBR Idea Cast, HIBT, Masters of Scale, or Goal Digger. 8:30 am-4:45 pm: Work time. 5-7 pm: Dinner, baths, and play time! Our kids go down pretty consistently at 7 pm. 7-8 pm: Cleaning up, organizing, putting toys and laundry away, catch up with Joe. 8-10 pm: Netflix and chill. 10 pm-2am: Depending on my workload, I crack my computer open again and put a few hours against whatever big projects I'm tackling that week. Any daily routines to suggest for someone who has a hard time focusing? I start the week off by creating my week at-a-glance, so I know what's in store. I organize my weeks so meetings are on M-T and the rest of the week can be used for big projects. This way I can keep trucking towards long-term goals while keeping the smaller administrative tasks from turning into big projects themselves. I tend to overestimate how long it takes to do the thing I don't want to do and underestimate the time it takes to do the stuff I want to do. How do you track appointments? Do you use paper and digital products? I use G-Cal for all appointments and paper pads to plan out my weekly tasks. For me, I need both a digital and paper system! What do you do on the days you feel frozen and stuck? I work on whatever feels good. If nothing feels good, I go for a drive, read a good book, or put myself in a place where I feel safe. Most often this is a sign my anxiety is about to get worse, so I take those "frozen" moments as a warning sign. Usually burn out is around the corner. How do you keep your mental health from getting in the way of your productivity? I'm really honest with how I'm feeling each day. If I'm in a rut, I can't always use willpower to rip me from it. You have to ride the wave. Once you accept the fact you have to experience your feelings in order to move on from them, it makes it easier to stop anxiety from compounding on top of itself. How did you say fulfilled and motivated and work while pregnant? You've got to give yourself a little grace. When I was pregnant, I didn't treat my ADHD with medication, so I really had to rely on healthy sleep and eating habits to keep my brain sharp(ish). I focused on projects I really wanted to get done, so I threw myself into product development. There were aspects of our business that suffered and I don't think I was a very good leader when I was pregnant. How do you remain productive when you are stressed? I write down all the reasons I'm stressed, no matter how silly. Then I write down what would have to happen today, next week, next month for them to become a reality. Most often this shows me how irrational my fears are. It doesn't make the emotional any less important, but at least you know they're only fears, not something you are actually dealing with. And if what is giving me anxiety is a REAL problem, I write down the ways I could make it better. If I do just one of those things, the anxiety lessens a bit. I think about the freedom I want for my family in the future and the people who's lives I want to help make better. What are your favorite tunes to listen to at work? I'm either listening to T-Swift or classical music right now. How do you remain high productivity without getting burned out? I like to think about productivity in terms of distance running. Some people are built for sprints, others for long sprints (me), and some for marathons. If you know how your energy usually flows when working on a big project, you can schedule your days, weeks, and months around just that. When I have a really intense week of working 10-14 hour days, I take the ENTIRE weekend off. Like, I don't talk to anyone, my phone is turned off, etc. What’s your go-to tool for keeping track of all your to-dos? Basecamp has CHANGED my life. All of my businesses run on Basecamp and Joe and I even manage our household tasks with the platform. What are the best ways to stay focused when you work at home? I work during the same hours, usually at night, after all our chores are done. If you office out of your home, you might want to consider doing "time batching" which allows for you to get all of your home-related to-dos out of the way before settling into work. It also helps to have a designated space and a backup coffeeshop or co-working space to retreat to when you need a change of scenery. What’s the hardest task for you to get started on? What project management tool does your team use? How do you jumpstart your ability to be productive when you’ve been in a rut for a while? If I can't get excited or in the zone about something in 10 minutes, I look for a task that I can easily complete to get that little high you get from crossing an item off your to-do list. Sometimes it's organizing my junk drawer. If I'm feeling really uninspired, I listen to a podcast or rewatch a movie that made me feel inspired. For me, that's Abstract or Chef's Table on Netflix or HIBT podcasts. How do you set up your work week so that it lends itself to productivity? Meetings in the first half of the week with lots of open time to focus on bigger projects. I also avoid multitasking at all costs. I turn off text notifications and all things email related. Once I’m going, I’m 100% but getting started is the hardest. I set a timer for 10 minutes. If I'm not in the zone by the time that timer goes off, I get to move on to something else. Kids, work, missing them, missing work -- how do you feel these things and stay productive? This one is hard. I remind myself that work is a huge part of who I am as a person, and by investing in that part of my life, I set an example for my kids that shows people are multifaceted and that "mom" is one of many hats I wear. I truly believe I'm a better mother because I'm able to step away from time to time. I used to shame myself for this fact, but it is who I am. It would be a disservice to my kids to pretend otherwise. What are your go-to steps on days like today for stay motivated? - Did you got enough sleep? - Have you had time to recharge? - Have you been taking care of yourself physically? If your answer is no to any of those questions, taking care of yourself becomes priority #1. If I can't leave the office to get headspace or I have deadlines I can't move, I remind myself that as soon as I finish, I get to put myself first. It seems counterproductive, but when I take the time to identify WHY I'm feeling unmotivated, it takes away the pressure to power through or that there's something wrong with me. You're not unproductive because you are BAD, you are unproductive because you're not 100% yourself. Basecamp -- We communicate and create to-do lists for each project in Basecamp. We are able to track our projects and assign each other tasks with all the information stored in one place. Airtable -- Our entire business is run on airtable, which means all our important information is at our fingertips at all times. Makes it easy to file away ideas and collaborate on projects. Alexa's timer app -- I use timers to get started and stay focused on one task. Leap Second-- Organizes photos and videos by date and stores highlights for compilation videos. ALPACA -- Helps make it easy to delete photos you don't need. Do you time block to tackle chores around the house? If so, would you share your schedule? I use time blocking at work and at home! Daily tasks: light cleaning and organizing what is out of place. Weekly tasks: laundry, bill paying, scheduling appointments, social plans. We used to try and fit weekly tasks in without structure and we never felt on top of things. We also delegate. I pay bills and organize our paperwork and Joe keeps our social lives and schedule in order. We do our own laundry and our nanny does the kids' laundry. We also have a cleaning service that comes to our house twice a week. How do you navigate when your unsure of the next “right” step? Decide what you CAN do, not what you should do. I truly believe done is better than perfect. You learn from missteps and most often the "right" step reveals itself once you have a better idea what is or isn't possible.